The exuberance and energy of Brazil returns to Sadler's Wells this summer as 38 performers from Rio de Janeiro bring alive the spirit that makes Brazil so unique in the smash hit Brasil Brasileiro. 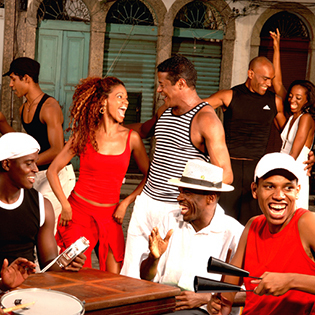 Famed for its sizzling, feel-good dance heritage, this is a country where the musical culture of Africa and Europe merge with dance to create the infectious rhythms of samba. From its beginnings as a ritualistic love dance to the excitement of a modern day Rio street carnival, Brasil Brasileiro features an incredible live band, and shows samba in all its forms: from the lightning footwork of the forro to the agility of capoeira and the groovy moves of batucada, taking you on a dance journey across this magical country.